British Prime Minister Theresa May has written to EU Council President Donald Tusk to ask for another Brexit extension to June 30. 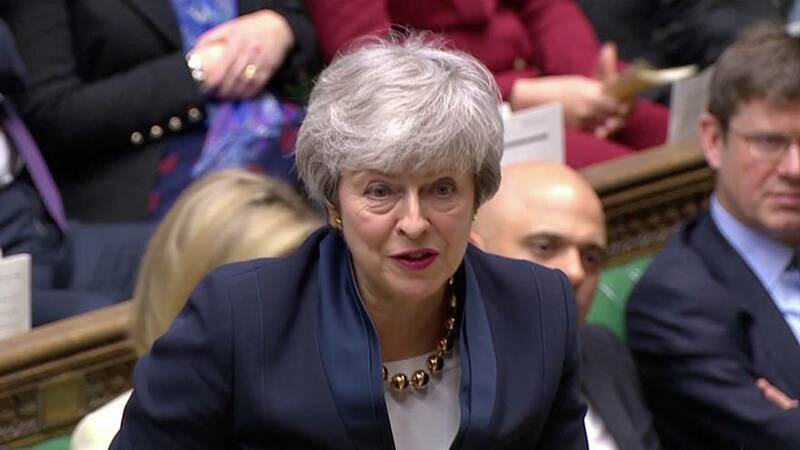 "I am writing, therefore, to inform the European Council that the United Kingdom is seeking a further extension," May wrote on Friday, adding: "The United Kingdom proposes that this period should end on June 30 2019." The UK is currently scheduled to leave on April 12, after a first extension was already granted. In her letter, May said that the country would exit earlier if MPs approve her deal before the new deadline. She also revealed that the government is "undertaking the lawful and responsible preparations" for the European elections in the event it is still a member of the bloc when they take place on May 23. "It is frustrating that we have not yet brought this process to a successful and orderly conclusion," May also lamented. May had already requested a longer extension to June 30 at the last EU summit but was turned down by EU leaders who imposed the April 12 deadline. A further extension to May 22 was also offered on the condition that British lawmakers approve the Withdrawal Agreement before April 12. "Instead of decisive action — requesting a long delay to allow the issue to go back to the people — Theresa May just proposes more short term-ism and a new cliff edge," she wrote on Twitter. The letter comes as an EU source confirmed to Euronews that Tusk plans to offer Britain a flexible extension of the date of the country's exit from the EU of up to one year, with the possibility of leaving sooner. But the plan has already been described as "premature" by a source close to French President Emmanuel Macron. The French leader has argued against granting extensions unless the UK government can present a concrete course of action. British MP Jacob-Rees-Mogg from the eurosceptic European Research Group — which has in the past strongly advocated for a no-deal Brexit — suggested the UK should be "as difficult as possible" if a long extension is granted. "We could veto any increase in the budget, obstruct the putative EU army and block Mr Macron's integrationist schemes," he wrote on Twitter. A senior EU official told Reuters that Tusk's proposal could be presented to British Prime Minister Theresa May at the EU summit on Brexit on April 10th in Brussels. If May accepted, Britain would have to hold elections to the European Parliament in May, the official said. "The only reasonable way out would be a long but flexible extension. I would call it a 'flextension'," the official said. "We could give the UK a year-long extension, automatically terminated once the Withdrawal Agreement has been accepted and ratified by the House of Commons," the official said. "And even if this were not possible, then the UK would still have enough time to rethink its Brexit strategy. A short extension if possible, and a long one if necessary. It seems to be a good scenario for both sides, as it gives the UK all the necessary flexibility, while avoiding the need to meet every few weeks to further discuss Brexit extensions," he said. What is parliament doing to prepare the ground? Britain’s House of Lords — the upper house of the UK parliament — rushed to approve a bill on Thursday that was passed a day previously by MPs that would cause a delay Brexit. The bill, tabled by Labour MP Yvette Cooper, would oblige Prime Minister Theresa May, by law, to request an extension to the Brexit process. It now requires approval by the Lords in order to become law. Peers had hoped they could fast-track the bill and hold a vote on Thursday although some Brexiteer Lords are trying to delay the vote. The Labour party said later on Thursday, the government had announced the law will not complete all stages of the House of Lords on Thursday and the remaining parts of the vote would be held on Monday. MPs have previously voted against a no-deal, but the motions were not legally binding. May fears Cooper's bill will increase the chances of the UK leaving the EU without a deal. That is because it would mean any extension May agrees with EU leaders at a summit on April 10 would have to be approved by MPs. “If passed, this bill would place a severe constraint on the government’s ability to negotiate an extension and reflect this new date in UK statute books by April 12," a Downing Street spokesman said. Even if Cooper's legislation is approved, EU leaders could still turn down a Brexit extension and push on towards a no-deal exit. It comes amidst ongoing talks between the government and the main opposition Labour party to find a solution to break the Brexit deadlock. A spokesman for May said on Thursday after talks wrapped for the day — and after Parliament was adjourned because of water leaking into the chamber from the ceiling — that the government had no plans to schedule indicative votes for Monday, suggesting the two parties had not yet reached an agreement. May's spokesman added that the UK would have to lay out its plan in a letter to EU Council President Donald Tusk a day before the scheduled April 10 meeting of EU27 leaders. Cross-party talks were described on Wednesday evening by May as “constructive, with both sides showing flexibility”, and as “useful but inconclusive” by the Labour leader, Jeremy Corbyn. Read more: What is UK Labour leader Jeremy Corbyn’s policy on Brexit? Both leaders have been hampered in their efforts by deep splits within their own parties. May’s Conservatives are split between a Eurosceptic faction advocating for a no-deal Brexit and another urging for close ties with the EU — up to remaining in the customs union. But splits within factions are also appearing even at the higher echelons. Labour wants to stay in the customs union with the EU, which raises the prospect of a "soft" Brexit that would keep the UK economy closely aligned to its biggest trading partner. But the party has its own infighting, with many supporters demanding a second referendum and other seeing a "soft" Brexit as a betrayal to voters in the 2016 referendum. In a letter dated April 3, 25 Labour MPs wrote to Corbyn to ask he go the “extra step” to reach a deal with May in order to avoid another extension which might require the country to take part in the May 23 European elections. “Delaying for many months in the hope of a second referendum will simply divide the country further and add uncertainty to the business. A second referendum would be exploited by the far right, damage the trust of many core Labour voters and reduce our chances of winning a general election,” the lawmakers wrote.